So, after about 45 minute s of hum drum DJ music, MIRP photographer and co-founder Jerimia and I ventured to the concession area, which was a terrible idea. The lines were long, and it was nearly impossible to get something to eat or drink. More people were definitely outside than inside. However, we found a place that made us a bowl of bland macaroni and cheese, and we sat in the window ledge and painstakingly watched people being bored. Jerimia was at the Soundboard positioned to shoot the first three songs; I was on the side of the stage left, unable to see anything going on. Just as the lights dimmed, an usher came over and asked me if I was alone. I said, “Yes.” She handed me a second row, dead center ticket and gave me a smile. I ran to the floor and nicely pushed my way through 26 people in the second row, who were now on their feet. 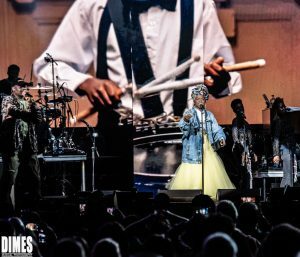 I must say, that the rumors of her being notoriously diva-like late were pleasantly dispelled as she took the stage a glorious six minutes early. While she could have saved the day (and our boredom) by coming on early, I suppose those who waited to arrive at the venue at her scheduled showtime would have been angry to miss it, so…maybe it was the best decision to be timely. 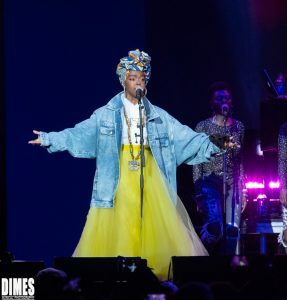 Songstress Lauryn Hill came out in a beautiful yellow tulle dress, reminiscent of Scarlett O’Hara or a little girl’s Easter dress, engulfed in a worn jean jacket that was five times too big for her. She was stunning! 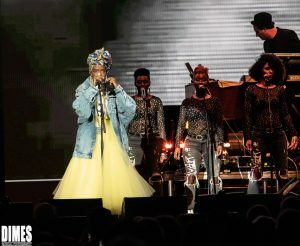 Playing two hours of classic Lauryn Hill songs for the 20th anniversary of the successful “Miseducation of Lauryn Hill,” as well as some Fugees songs, Ms. Hill interspersed these sometimes-rearranged songs with messages of positivity and togetherness. She seemed to lighten up and adapt to the crowd as the set progressed. She talked about how her parents gave her their old vinyl collection and how that shaped her musical style. She talked about building up others, and together we could universally change the course of our predecessors’ damage. The highlights for me was when she talked about the music industry and said, “Be authentic or you can’t keep sustain it”; I thought it was very powerful. While she might be a little tainted by the world and industry, her words were prolific and uplifting. She sang the People’s music, and I believed every word, as she spoke and sang with intensity and purpose.